I've had the Shiseido Perfect Refining Foundation for almost half a year now and during these times, it's mostly just sitting on my dresser. Not that it's a horrible product (I actually like how it performs and find myself wanting to use it on most days), but it has consistently aggravated pustules every time I use it. I know it's a serious problem and that I should just get rid of the black bottle, but the advantages I get from it outweigh its most unnerving flaw. I seriously don't understand why Shiseido foundations are acting funny on my skin (even the Perfect Smoothing foundation, which I loved to bits until the day it broke me out). 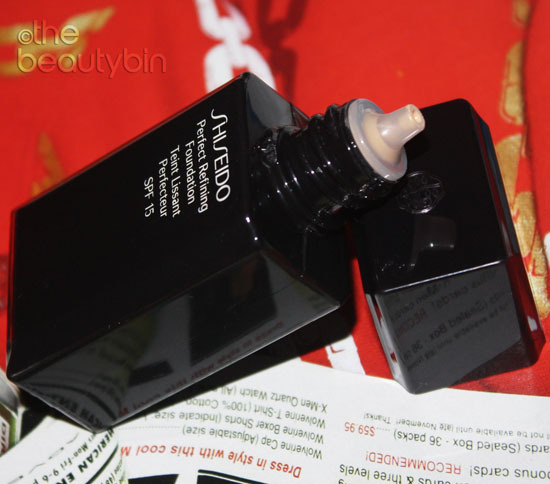 I give you an ultimatum my dear Shiseido Perfect Refining foundation. Today, I have an almost clear skin and if you mess with that one pimple persisting on my cheek, I have no other choice but to let you go. Oh no!! Goodluck! sana it works this time! pero since you've tested it so many times, seems the brand has a certain ingredients you're allergic to! Let us know what happens ok? Goodluck! Oh my, I had high hopes for this one and was waiting for a feedback from you. Didnt get the shiseido liquid sun foundation, they dont have one that's yellow enough for me. It looks a little bit orangey. Have yet to check out the other foundations they have. Particularly that one with SPF 30 stick foundation which is also sweat-resistant. Saw it on the website but I havent checked of it's available here. It's not in their sun protection line though and the packaging is cylindrical. Have you seen it?